1. Open File At Cursor. 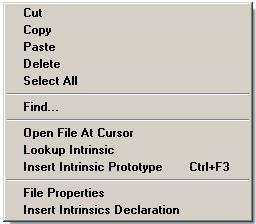 This option looks for a filename under the cursor; and if it finds one, opens the file in the Include Editor. 2. Lookup Intrinsic. This option interprets the word nearest the cursor as an intrinsic and looks up the intrinsic in the help file. If the intrinsic is found, the help topic for that intrinsic is displayed. If it is not found, the help index is displayed. 3. Insert Intrinsic Prototype. This option enables you to insert a prototype for any intrinsic. 4. File Properties. This option displays detailed information about the current file. 5. Insert Intrinsics Declaration. This option inserts an "include" command for the standard EXPL code intrinsic list.